ISF researchers have a strong grounding in the scientific drivers of climate change and a practical understanding of the impacts climate change is likely to have across all sectors of society. Our experience in undertaking climate change adaptation work is broad, covering local to international settings in both urban and rural contexts and includes the water sector, behavioural change initiatives, social, institutional and ecological resilience, buildings and cities, resource management and international development issues. The Pacific American Climate Fund, the Institute for Sustainable Futures and the New Guinea Binatang Research Centre are working together to enhance the capacity of local communities and government to support biodiversity and adapt to a changing climate in Papua New Guinea. This handbook is based on a series of training workshops focused on identifying locally important ecosystem services and how these services may be affected by climate change and development. Ecosystem Services are the benefits people obtain from nature including food and water - they are critical for supporting human life and changes in these services affect human health, well-being and livelihoods. In the water-scarce Pacific Island nation of Kiribati wells that supply water are increasingly affected by saltwater intrusion due to high tides, sea level rise and increasingly frequent storms and tropical cyclones. 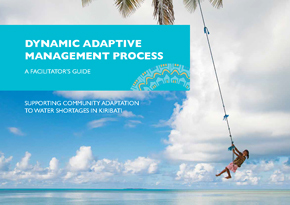 A handbook has been produced to help local facilitators train communities to identify climate change adaptation strategies by drawing from various sources of knowledge, including traditional knowledge. Researchers have experience in local government contexts, specifically developing local Adaptation Plans and strategies, and thus have an understanding of the issues confronting local government in adaptation planning, particularly across spatial scales. ISF has worked with various levels of government in the past to improve governance structures that constrain capacity to plan and implement sustainability and adaptation projects. ISF is well known for expertise in the water sector, with work over recent years heavily focused on adapting to a water constrained future as a result of climate change. ISF has worked with a range of clients including local, state and national governments and related authorities, community groups, the private sector and universities in providing strategic research to support decision making and action related to adaptation for improved water management. ISF has a breadth of experience in climate change adaptation in relation to behavioural change and capacity building. By incorporating techniques such as citizen’s juries, deliberative democracy and targeted training programs, ISF has empowered a range of different groups with knowledge on how to make better decisions with regard to individual and collective responses to climate change. The ISF team also has practical experience in implementing adaptation initiatives with a range of diverse stakeholders and understands the importance of the social, economic and cultural context in which adaptation is set. At the international level, researchers have on-ground experience and understanding of community-based, regional and national-scale climate change adaptation initiatives in developing countries in the Asia-Pacific region both in urban and rural settings. In addition, researchers have been involved in climate change policy development including monitoring and evaluation techniques and the translation of new policy into national planning and implementation instruments. See more of ISF's international development research here. © Copyright UTS - CRICOS Provider No: 00099F - 28 November 2018 08:00 AM. The page is authorised by Deputy Vice-Chancellor and Vice-President (Corporate Services).